Every aspect of this case has been designed to provide the ultimate protection for portable printers. The rugged exterior is constructed from premium grade heavy-duty resin that is resistant to bumps, drops, impacts and crushing forces. The IP67 rated waterproof seal can be submerged in 3 feet of water and prevents moisture, dust and other factors from damaging your valuable device. The Interior of the case is fitted with Dense Customizable Pick and Pluck Foam To make Compartments for Your Printer and accessories. With a durable exterior and padded shock absorbing interior, you can be assured your device is always safe during transport and storage. The high quality construction of this case provides a professional appearance and can easily be carried by your side. The non bulky design can be stored in the car, office or brought to business meetings during travel. The rubberized carry handle is spring loaded and automatically closes back to the case when not in use. Dual slide compression locking clasps securely keep the case held shut at all times. 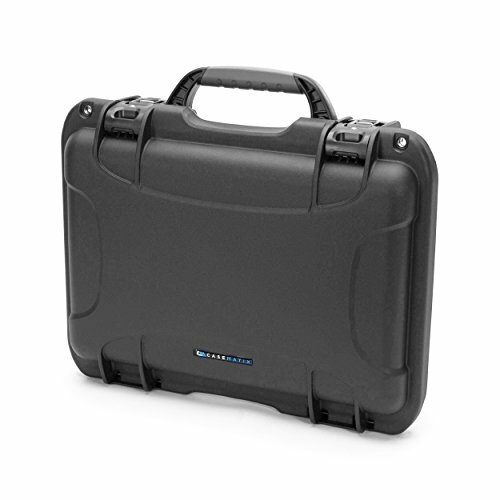 The exterior dimensions of the case measure 18.5"" x 14.5" x 6.25" and it has built in padlock holes for security. The fitted foam interior of this case features pick and pluck diced foam cubes that can be removed to create the perfect fit compartment for your printer. The top and bottom of the case are also lined with dense convoluted foam padding to provide shock and impact protection from all angles. Ideal for transport of Office Supplies or Business with dual slide compression locking clasps , padlock holes , folding rubberized carry handle and exterior dimensions of 18.5"" x 14.5" x 6.25"